You are met upon arrival in Entebbe and transferred to your hotel. 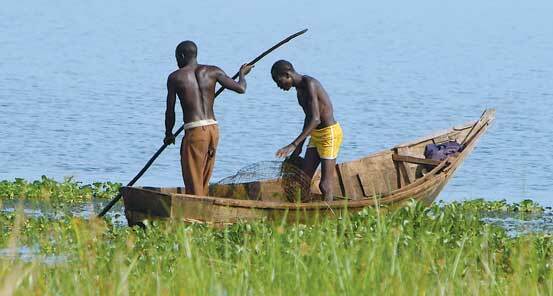 Entebbe is a pleasant and convenient city in which to start our journey. We meet this evening for dinner and orientation. Overnight in Entebbe. After breakfast we visit the local botanical gardens situated on the northern shores of Lake Victoria. In the years after its establishment in 1898, the garden was very active in plant introduction from many parts of the world. Crop species of foreign origin such as cocoa, coffee, tea and rubber were introduced and evaluated. Here we enjoy a guided walk through a nature's lover paradise which includes a thick forest canopy and beautiful views of the lake. We then journey by speed boat on Lake Victoria to Ngamba Island where we enjoy lunch. Ngamba Island is a sanctuary for chimpanzees. We learn about one of our closest relatives and also about the work that is done on the island. We can see the chimpanzees at close range, watch their behavior and their playfulness. We also observe one of their daily feedings. 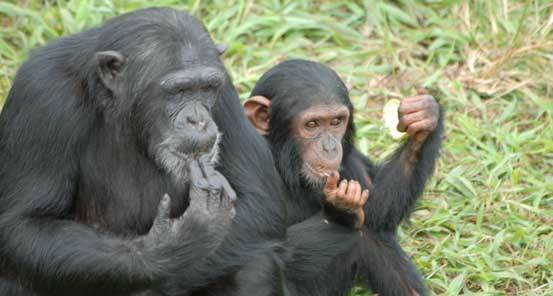 It is a real treat to see the chimps in this comfortable and intimate setting on Ngamba Island. In the late afternoon, we return to Entebbe where we can relax before dinner. Overnight in Entebbe. Today we make our way to Kampala, the largest city and capital of Uganda.The city is divided into five boroughs that oversee local planning: Kampala Central Division, Kawempe Division, Makindye Division, Nakawa Division and Lubaga Division. The city is coterminous with Kampala District. We will pass by the Independence monument, and the Parliament of Uganda. From here we continue to Rubaga & Namirembe Cathedrals before proceeding to the Kabaka's Lake. From here we make our way to our central hotel where we enjoy a light lunch. In the afternoon, we make our way to the Abetavu Children's Village, which was started by a young Canadian woman (Carli Travers) and her Ugandan husband, Robert. Carli and Robert had a dream to start an orphanage after seeing young children on the street with no one to help feed them, shelter them or love them. First, they adopted 6 orphans and the family has been growing ever since. ElderTreks is very proud to be a part of such a loving and caring project. ElderTreks was the main sponsor to build the house and continues to support them financially. We visit Carli, Robert and all of their children during our visit to Uganda. We enjoy an afternoon visit and learn about some of the daily struggles for those less fortunate. We have found that our travellers are profoundly touch by what they see and experience during our visit. We will continue to support and visit Abetavu village, to meet the family and do our part to give back for such a beautiful cause. We return to our hotel in Kampala for dinner. We start early with a drive to the Ziwa Rhino Sanctuary. An experienced ranger will lead you on a hike to find the resident white rhinos. Unfortunately, rhinos were hunted to extinction in Uganda but are being re-introduced with the longterm goal of seeing them once again roam the grasslands of Uganda. It is a truly fascinating experience seeing these white rhinos up close. Following our rhino encounter, we drive to Murchison Falls. Overnight in Murchison Falls National Park. Early this morning, we set off on a safari game drive. We take a ferry across the Nile before searching for elephants, lions, giraffes, hippos, baboons, several species of primates, numerous types of antelope and of course, excellent birding opportunities. We return to the lodge in time for lunch. This afternoon we drive to the top of the falls where we can see and feel the rage and thunder of these magnificent falls. We walk down the stairs to the base of the falls to meet our boat. We spend the remainder of the afternoon cruising the Nile in search of wildlife before returning back to our lodge. Overnight in Murchison Falls National Park. Enjoy a morning boat journey along the Nile to the delta, passing hippos in the water, and gliding past riverbanks teaming with birdlife. 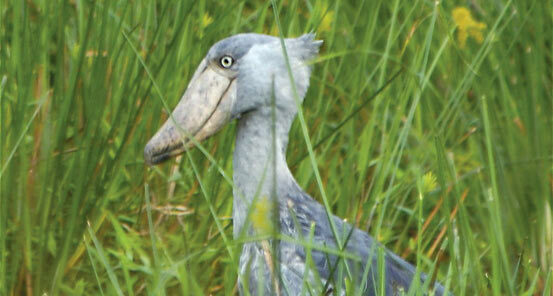 At the delta, keep a watchful eye for the massive but elusive shoebill. After a picnic lunch we meet our safari vehicles and enjoy a game drive in Murchison Falls National Park. Here we will have an opportunity to view the wild inhabitants who make this place their home. The park itself is part of the Great East Rift Valley. After our safari we return to the lodge where we can enjoy the rest of the afternoon at leisure. Overnight in Murchison Falls National Park. Today we have a long drive to the mountainous tea plantation area of Kibale. As the elevation increases, the scenery becomes ever more spectacular. Pass by the many tea plantations, small rural towns and several crater lakes. Overnight in Kibale. In the morning, we set out to enjoy one of our great ape encounters. We hike in Kibale National Park and have a rare opportunity to see chimpanzees in the wild -Â truly a special experience. Enroute, we may see other inhabitants of the forest. After lunch, enjoy a swamp walk, where you may see other primates and various bird species. Overnight in Kibale. After breakfast we drive to Queen Elizabeth National Park. We enjoy our lunch at a hotel overlooking the Kazinga channel. We explore the Kazinga channel by boat, gliding past the banks full of birds, buffaloes, hippos, crocodiles, elephants and other park inhabitants. Overnight in Queen Elizabeth National Park. We depart for Ishasha in the southern part of Queen Elizabeth National Park. Ishasha is known as the region where you can find the rare tree-climbing lions. Our drives are in the park so we can enjoy wildlife viewing while traveling to our next destination. Overnight in Ishasha - luxury tents on the banks of a river. We enjoy 2 game drives today, including a drive to the Edward Flats, providing another opportunity to see the shoebill, and also the region where we hope to find the tree-climbing lions. After several days of game viewing, relax at our luxury tents located at a beautiful spot on the banks of the river. Overnight in Ishasha. This morning we depart for Bwindi Impenetrable Forest. Upon our arrival we enjoy late lunch at our lodge followed by an afternoon at leisure. Overnight in Bwindi. Today is easily one of the highlights of the entire journey as we trek up the side of the mountain to spend time with one of the resident gorilla families who make Bwindi forest their home. The reward is great, but there are certainly some challenges along the way. We start in the morning with a briefing at the Park Headquarters about what the trek will involve and the etiquette of observing and photographing gorillas. Tracking wild animals can be a challenging physical activity. 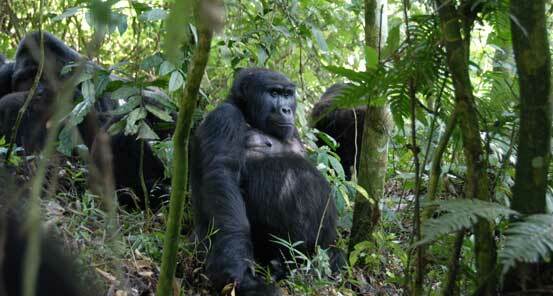 Eight people are permitted per group and a total of 24 people per day in Bwindi as there are 3 gorilla groups. Depending on which gorilla group you will visit, your trek may take anywhere from 1-7 hours. Local gorilla trackers follow the location of each of the gorilla groups. People are assigned to visit one of 3 groups based on their hiking abilities, the terrain and the distance the gorilla group is from park headquarters. Once we find the family group we will have 1 hour to observe and enjoy them. Our trek starts by climbing along the switchbacks going up the side of the mountain. The climb may be upwards along relatively good paths or we may forge a new path. Every trek is different but be prepared for steep and dense areas, good paths or no paths. To assist with your trek, ElderTreks provides you with a local trekking guide or porter who will give you a hand along the way. This will surely make your trek more enjoyable and easier, while also supporting the local community. The local economic spin-off is important as it encourages the entire local community to support the efforts to protect the gorillas and their habitat. This education and support is important for both locals and visitors alike. Payments/tips for the porters are included. Today's visit with one of the Bwindi resident gorilla families will likely be one of the wildlife highlights in your life. Few things can compare with the playful fighting of the young gorillas, a mother gorilla caring for her baby, or the adrenaline rush of seeing the massive silverback giving the term 'alpha male' a whole new meaning. After your gorilla encounter, return to your guesthouse and spend the rest of the day reliving your experience. Overnight in Bwindi. After breakfast, we spend the morning walking through Bwindi village. Here, we have an opportunity to meet the village medicine man and learn about his healing herbs and medicines. We return to our lodge in time for lunch. This afternoon we visit the Bwindi Community Hospital followed by a local community project for women in the region. Overnight in Bwindi. We will depart in the morning after breakfast and drive to the border at Kisoro to enter Rwanda. We drive via beautiful mountainous forests, and through local villages to reach this bustling little border town. On a clear day, you should be able to see the row of volcanoes, lining up along the border like sentries! Entering Rwanda, it is a relatively short drive to your lodge. Settle in for the balance of the afternoon, or possibly go for a short walk in the area. Once again, the views of the volcanoes in the early evening can be quite spectacular. Overnight in Volcanoes National Park. After an early breakfast, we depart to visit the golden monkeys, which along with the mountain gorillas, is another highlight of Volcanoes National Park. The Golden Monkey (Cercopithecus Mitis Kandti) is a local subspecies of the widespread Sykes Monkey, also known as the “Blue Monkey” and is endemic to the high altitude forests of the Volcanoes National Park area. The monkeys are playful and inquisitive and often spend their time leaping from bamboo branches or frolicking on the forest floor. Golden Monkeys are among the most endangered primates in Africa and is believed the only viable population of these monkeys is in the Virunga Volcanoes. Two groups each with over 100 individuals are being habituated for visitors in the Virungas. The Kabatwa group, found in the east of the park on the flanks of the Sabinyo volcano and the Musongo group higher up on the flanks of the Karisimbi volcano at an altitude of about 2800-3000 metres. For those who have booked to visit the mountain gorillas, we will also depart early after an early breakfast for a day of mountain gorilla tracking. You will be transported by vehicle to the start point at the ORTPN offices, to meet your gorilla mountain trekking guide. 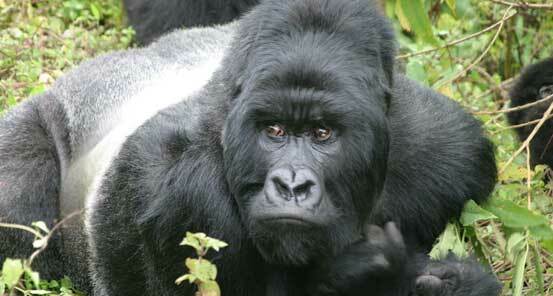 A short briefing will follow by either a transfer, or a walk, to the allocated gorilla family. As with Bwindi in Uganda, the hike can vary in length and terrain, but be prepared for an average of 3-4 hours hiking, plus of course the hour spent watching the gorillas. Return to the lodge for a hot shower and to relax! Overnight in Volcanoes National Park. Drive to Kigali, the capital of Rwanda... the roads are good, but quite busy with pedestrians! The rest of the day in Kigali and we will have time to visit the Genocide Museum, as well as other historical sites of interest. Tonight we enjoy our Farewell Dinner to reflect on this incredible journey. Overnight in Kigali.